It’s been hard to figure out how to commemorate Nelson Mandela. I first came across the news from Kumi Naidoo’s tweet yesterday– another inspirational leader leading the charge on the anti-apartheid movement – and was momentarily paralyzed in a state of disbelief. I came to accept it promptly after since news of his deteriorating health conditions had been periodically popping up on the google news feed, particularly around Mandela Day. In recollecting my knowledge of Mandela, I realized that I hadn’t really taken the time to read his autobiography yet. He’s been a popularized political figure since as long as I can remember - the film ‘Invictus’ was perhaps the first insight into the psyche and values of the revolutionary man. 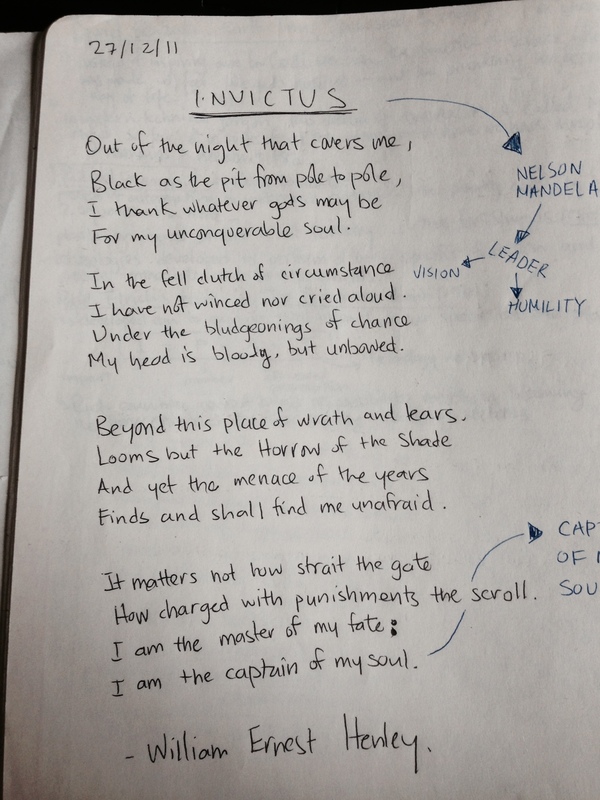 It was after watching that film on December 27, 2011 that I searched up William Ernest Henley’s poem and wrote it all down to try understanding how it brought solace and strength to him while imprisoned for 27 years in Robben Island. How much self-determination and strength it took to remain the “master of [his] fate” I cannot imagine – I am doubtful sometimes of my own ineptitude and lack of self-confidence I feel towards my values and beliefs. But he was able to do it and live 95 years to tell the tale and strive towards his ideals for a free and just society. In our fast-paced society with a plethora of social media platforms where we no longer have the time for direct conversations, the news of his passing has been welcomed by ubiquitous posts and re-posts of condolences and his famous quotes. #RIPNelsonMandela remains a worldwide trend right now competing alongside the dedicated fanbase of Selenda Gomez on twitter. I too retweeted Naidoo and published to the world that I am in line with current news and paid my respects. But 140 characters doesn’t suffice to encompass the struggle we have been in for the last few decades or reflect the appreciation for Mandela’s charge against apartheid. Twitter founder Jack Dorsey is famous for his saying that “constraints inspire creativity.” But such limitations are also manifesting an appetite where we can only take in short bursts of information without soundly analyzing the information being thrown at us. I wonder if the mindset seems to be, and I speak for myself also, that communicating our opinions on social media and posting them for the world to read them marks one’s contribution to the cause. Maybe it seems the only remaining option in addition to signing online petitions or take ‘action’ that requires minimal time effort. But justice isn’t realized with the hit of the send button or the number of likes one receives for their post. I think we should consider whether we are paying our respects simply because of his legacy or if we actually comprehend the magnitude of his actions and consequently, we also intend to join the same fight for justice. I am not discrediting our adoration for him on facebook or twitter; in fact, they have become essential and unavoidable tools to connect with the world today. But I would implore all of us to think about whether we are also walking the same steps as the likes of him and acting on the social values that give us our humanity; I know that despite being a relatively informed citizen, I am not always conscientiously filtering everything I do with all my values. Alternatively, it might be the case that we should be seeking to change the mindsets of those who are not sharing their thoughts in the same manner & engaging with the online community due to ignorance, apathy, or contrasting opinions. Systems of oppression continue to pervade our society – some we interact with and live in on a daily basis and some implicit in our behaviours and values we have yet to recognize (at least the majority, if not all, of us). But we choose to accept these circumstances. I recently came across Robert Unger’s words: “at every level the greatest obstacle to transforming the world is that we lack the clarity and imagination to conceive that it could be different.” Rightfully so. Unfortunately, mainstream media has become an unreliable source to provide clarity and adequately document human tragedies in countries that seem obscure to us. In many instances, we lack “a critical, independent and investigative press [which] is the lifeblood of any democracy” (NM). Living in Canada perhaps cloaks us even further from the reality of how harsh the world truly is but we too are drowning in shocking levels of poverty in our advanced societies. Political turmoil is blowing up trains and burning people in buses as the scars of a bloody war for independence resurface. Conflicts over borders and sovereignty dominate global political agendas. Human rights activists are silenced, shot, and buried unceremoniously. Military intervention and strikes continue to seem a favourable tool for conflict resolution. So, let’s not kid ourselves when we join the bandwagon to appreciate Mandela but forget the essence of his words. Recent walkouts led by civil society groups at the COP19 Climate Change conference was a direct action to raise concern for systematic silencing of those who dissent. Colleagues who I befriended on facebook after returning who had become COP veterans seemed to have quite a self-defeating tone in their reflections. Again, rightfully so. David Suzuki reflected on the outcomes and highlighted the report by Global Witness that more than 700 environmental and Indigenous-rights activists have been murdered in the last decade. Strong actions on climate change is intimately connected with the human rights movement – we are on the verge of catastrophic consequences in the near future. Anote Tong, President of the “flyspeck” Kiribati, inhabiting 103,000 citizens, is seeking to purchase land from another country when the island is submerged in the Pacific Ocean. Interestingly, another quote by Mandela finds him saying that “if you want to make peace with your enemy, you have to work with [them]. Then he becomes your partner” (NM). However, I don’t anticipate such an approach being fruitful so far with corporate fossil fuel partners though they need to be engaged to change in some manner. I have some doubt about whether he followed his own words in his struggle against apartheid. However, “fundamentally an optimist”, he would want us to continue to build the climate movement and advocate for a truly sustainable society (NM). We should remember that Nelson Mandela was not a saint; our faults and complexities make us human. South Africa is still not a nation at peace and racism hasn’t been abolished – the cold stare of discrimination can still glares at us regardless of where we live. But his humility, leadership and resilience for justice distinguished him as an icon whose words still reverberate with us to this day. We are fortunate to have been graced by his presence. Likewise, we should take pride in his legacy but also demand our leaders give the same respect by practising his values rather than playing recorded versions of the same eulogy in their tributes. The human tragedy that perhaps upsets me most might be our myopic vision for our society; we are arrogant and unable to think beyond our own lifetimes to effect meaningful change. So, borrowing the words of Rusted Roots, let us send Nelson Mandela on his way by being courageous. “The brave man is not he who does not feel afraid, but he who conquers fear” (NM). Various renditions of this song on Soundcloud have been great company in writing this post. While his death is difficult to accept, we should capture this fleeting moment for introspection and strive to “live in a way that respects and enhances the freedom of others” (NM). In the coming years, we will be mourning other leaders as well – let’s not make it a habit to mourn and reflect only at those times. 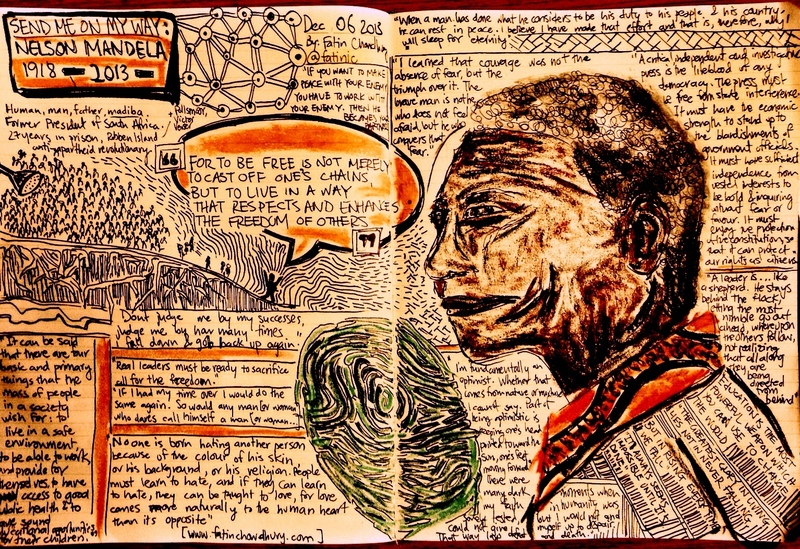 Nelson Mandela has been on a long walk to freedom; let us take over where he left off and continue on the path. I am often reluctant to use popularized quotes out of fear that it is being used out of context. While quotes allow us to understand one’s opinion on various matters in digestible portions, they do not make up the whole essence of the person’s views. But I hope I used them adequately to support my thoughts. In the future, I intend to write a post on how and whether we should use quotes – it has become a norm to start every essay with the words of a popular figure.